In which the YA author showcases the great and awkward of the teenage years. Today I give you a photo that isn’t as self-deprecating as usual (more great than awkward), but one that is close to my heart for the date in which it represents. Never mind that I’m wearing oddly-patterned stirrup pants. (Luckily I pulled my socks up over the stirrups.) Never mind that Matt gets completely lost in the photo if you’re not putting the effort in to see a dim outline of his sweater. And never mind that the photographer posed us in such a way that I actually look like I’m twiddling my thumbs and Matt is pointing it out. Because no, this was a great date. A rarity in high school. I barely remember anything about the plot. I know there was a dance at his school and I know he showed me some of his artwork, which was impressive in a way that went way beyond the fact that I intended to flatter him anyways because I liked him. He could paint. I know there was kissing; I definitely remember he showed me how to do it well. (We all have one of those, right? Where you’re like, ohhhhhhhh, that’s how kissing is supposed to be!) Mostly what I remember is his character. Totally gentlemanly. He was kind and attentive. If he was nervous, he hid it well. He didn’t mind that I was completely nervous and it showed all over me. Oh nervous girl that was me in high school, I wish I could tell you to just relax! But thank you, Matt, for your kindness. That will always stay with me. I couldn’t have asked for a better first boyfriend. There will be more YA author guest posts coming in the near future. And as always, if you’re a YA author, and wish to be featured over here for self-deprecating Sunday, then please contact me at jody(dot)mugele(at)gmail(dot)com It’s more fun than church. This Sunday we have Junior Prom. This is not the year of the escalator incident. That was the year before. You’ll see in this year, I’ve decided to wear a gown with straps. My date was the sweetest guy ever, and nervous as hell. He was a class behind me. We met during a drama production (I think). I asked him to go to Prom during a game of truth and dare with my friends. We’d already been dared to kiss for the count of 10 (I stretched it to 13), so I figured he liked me. Sure he liked me. He just didn’t LIKE Me like me. In fact, he liked boys. Actually, it turned out to be a stress free night of dancing fun with no awkwardness with what to do post-Prom. Now I can’t escape this Sunday without making fun of my style. Let’s call this one an ode to John Hughes. Pretty in Pink, anyone? Oh, taffeta, you crazy loathsome fabric! And lace? Ladies, how did we stand it? At least I sparkled. By the way, I was often told Molly Ringwald would play me in a movie. but that’s a different post. 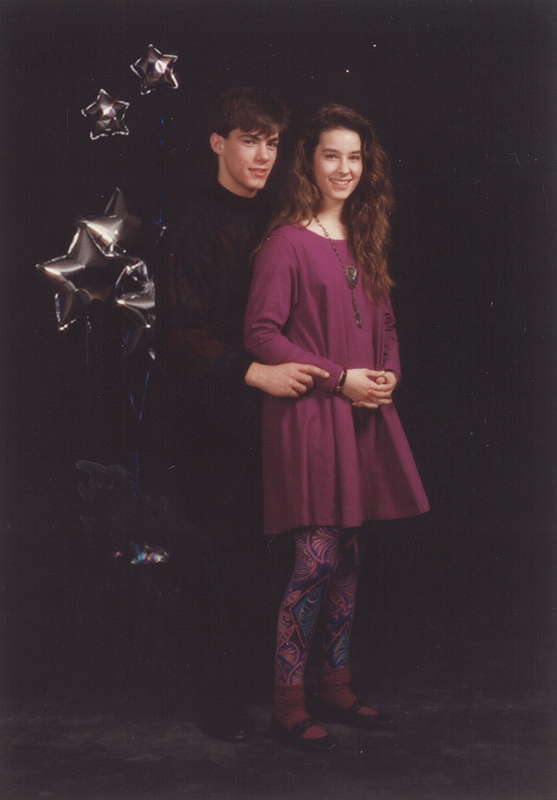 And here’s an interesting side-note: when I got to college, I learned my roommate had worn the same dress to her Prom. We should have taken each other to that dance. Also, what is that Bizarro decoration behind us? In which the YA author showcases what’s strange and lovely about the teenage years. Today I give you my seventh grade school photo. Um, it’s not a mullet, right? Riiiiiiiiiiiiiight? I’ve got at least an inch I could trim back on each side before it qualifies, I think. Also, there’s that perm. The first one of you (KCShoup) to say something about a permullet (I can’t compete with this little sweetie) may find dish-soap in her coffee. Just saying. I think what saves me in this photo is the patriotic motif I have going on here. It’s almost like a foreshadowing of my aspiration to write a Young Adult novel about the Navy, no? Also, I really had a thing about the collar shirt under the sweater. Maybe everyone did back then. Remember my eighth grade photo? Oh go on and have another look. You’ll feel better about yourself. This is what Jr. High cheerleaders are made of in the 80’s. 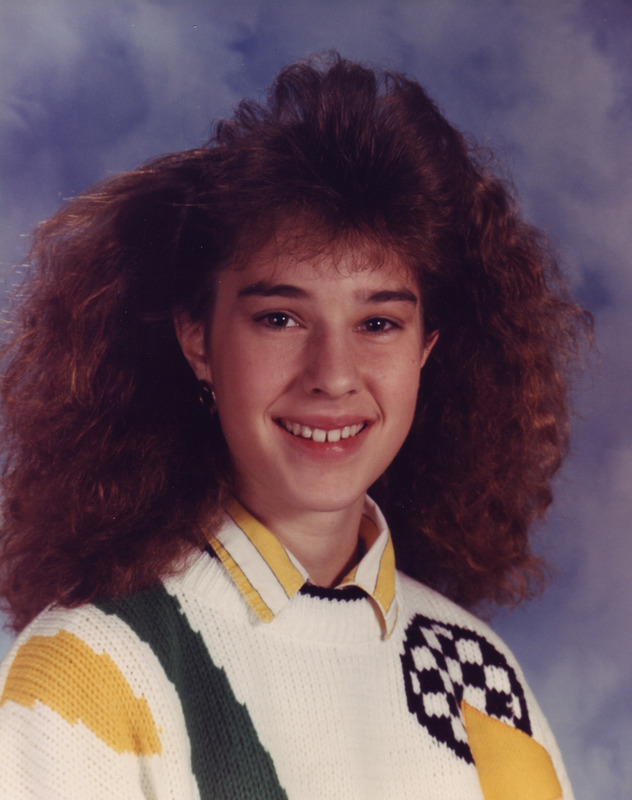 And furthermore, that eighth grade shot…seriously, I make the bumpit feel bad about itself. Who has happie hair? Jody Sparks has happie hair. But wait, there’s more! To this day, I bump the bumpit off it’s pedestal! Check my head-shot. That scarf look requires no fancy hair heightners. It’s just me, a hair tie, and the scarf. But, we’ll see how I feel about my style now, in another 15 years or so. In which the YA author showcases her teenage years in all their awkward wonder. What, no one else goes cherry-picking in a fedora and sweater vest? 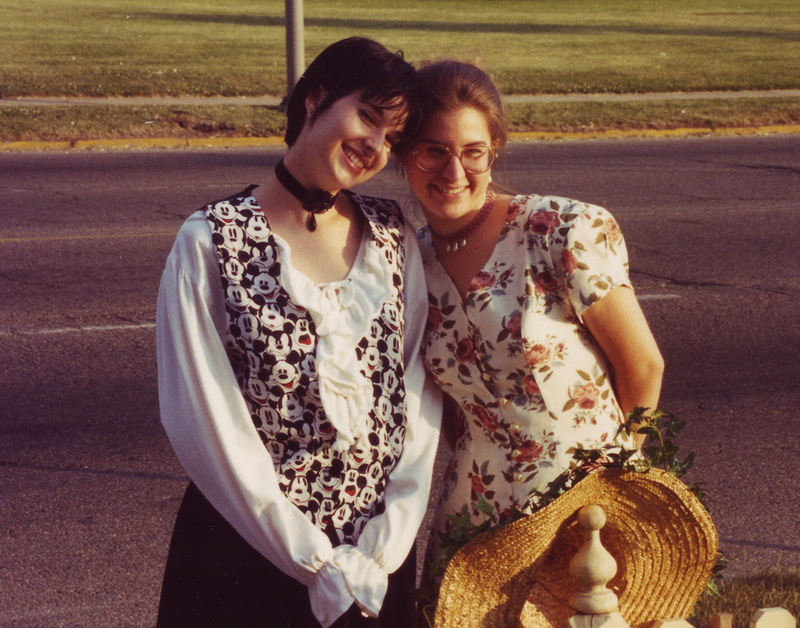 In which the YA Author showcases her teen years in all their awkward glory. To be fair, I think this photo was taken circa 1984/1985 which puts me at about 11-years old, so this falls more in the awkward category than it does the the teenage years category. But I couldn’t resist showing off the those bangs. (I’m on the left) and by bangs, I mean BANGS! Those things reach back nearly back to wall I’m standing against. I also couldn’t resist answering your burning question about this rollerskating rink, you’ll be pleased to know that, yes! They have NACHOS! 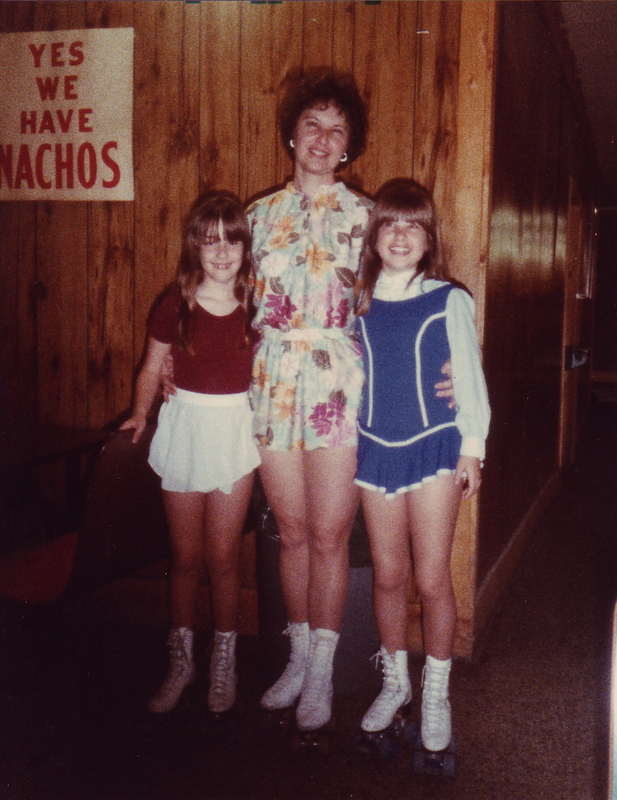 Why would we wear theses Peggy Fleming outfits to the roller rink? Well, because we had roller skating lessons, sillies! See that beautiful lady between my sister and I? That’s my mom. (Dudes, admire that posture!) She roller-skated competitively before having us kids, once taking second place in the World Championships in Pairs. I actually come from an incredibly athletic family. My dad also briefly played professionally with the Detroit Lions defense (you heard me, Jim). So, yeeeeeeeeeeeeeeeah, I’m a writer. Sorry, Mom and Dad. This is my eighth grade school photo. I kind of can’t believe I’m posting it. Can you imagine if I’d worn my blue glasses? You know what I remember about this photo? It was re-take. I hated my first one. But this one…this one! It made me look good! What can we learn from this photo? I really don’t know. Seriously, how do I spin this into something positive? Also, is there anyone who reads this blog whose former fro is jealous? So, I went home to Indianapolis for Thanksgiving. It was a lovely for many reasons. One of those reasons was that I found some new teenage photos. But also, I read some great books including Mudville, by Kurtis Scaletta, which you should read, or buy for the middle grade people in your life for the Holidays. (If you celebrate that sort of thing.) 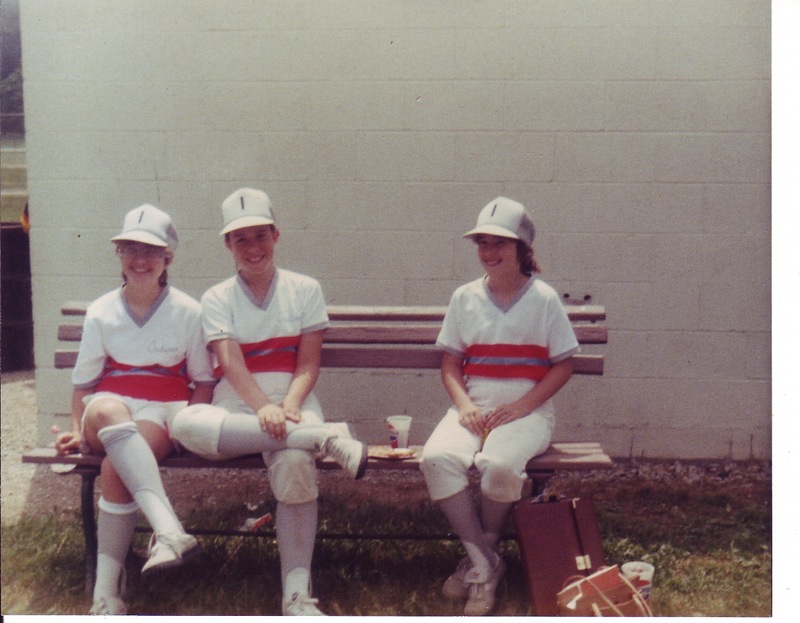 In honor of this wonderful book, I’ve decided that today’s photo should showcase my little league years. In this photo (I’m on the right), I think I’m 12 or 13–possibly younger. As if the photo isn’t awkward enough, what with the high waist pants, rec specs, and Iron-on decals, that ‘I’ on our hats stands for Indians. Nothin’ like a little political incorrectness to toss around with the softball. And Kurt, if you happen to be reading this, I was the catcher. 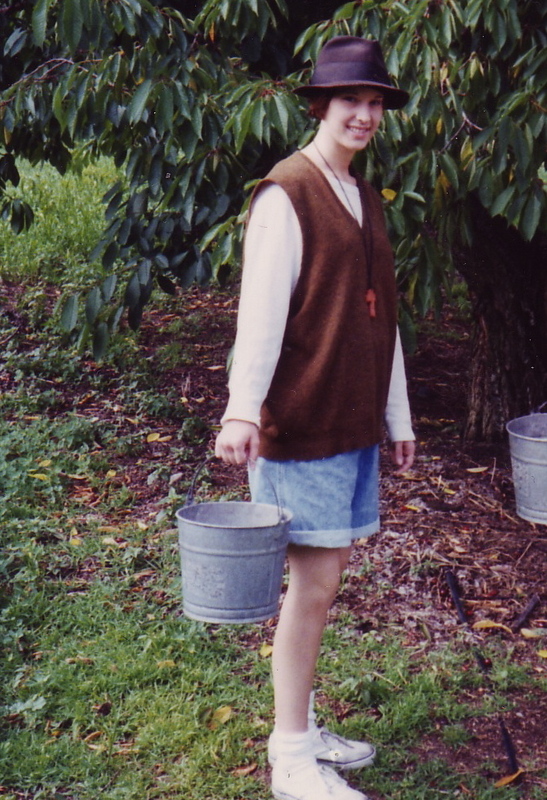 In which the YA author showcases her teenage years in all their awkward glory. If you thought I brought something special to the Eighties, this photo treats of what I brought to the Nineties. This was my freshman year of college, I think. I’d cut my long hair, dyed it black, found a poet’s blouse, and was clearly on my way to leading the Goth movement, but still couldn’t part with my bizarro Mickey Mouse obsession. *shakes head* Believe it or not, I got dates. Clearly, this proves that confidence trumps fashion sense in the world of dating. With me in this photo is my sister. She clearly had more refined style, her choker (hey, it was 1994) looks pretty and subdued, and if she had her straw hat on, she’d be quite the southern belle. (We were in college together in Tennessee. Perhaps this makes her outfit more acceptable?) Does this kind of remind anyone besides me of The Country Mouse And The City Mouse? And still people would ask if we were twins. What do you all think; do we look alike? 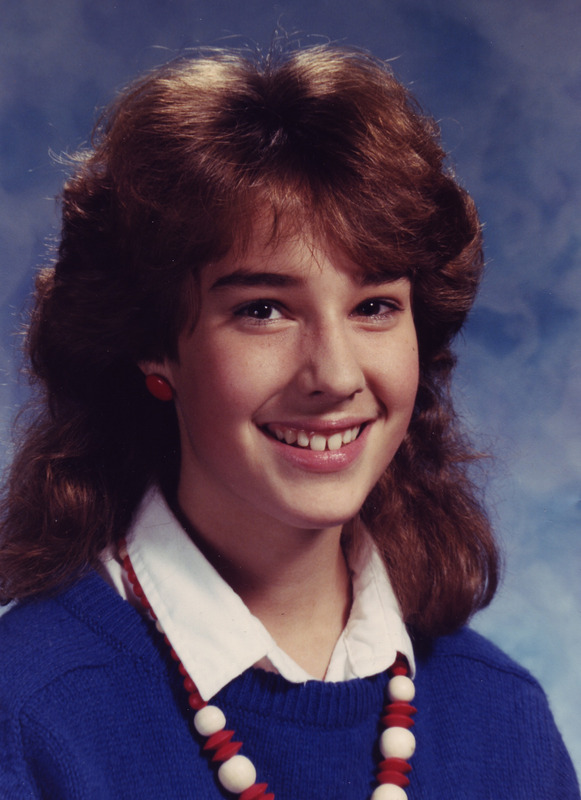 In which the YA author showcases her teenage years in all their awkward glory. 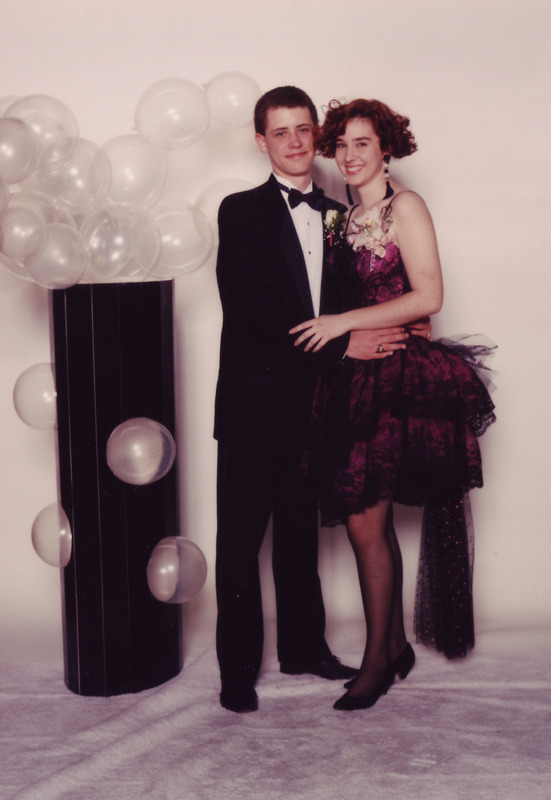 This one is for you, Jennie Miller: Senior Prom 1993. So this was my fourth Prom. I took Brian Taylor–same guy I took the year of the escalator. Perhaps he hoped for a sequel to the first show? Anyhoo, Jennie took Cory Miller, who she eventually married. I had grown tired of the fancy doofy prom dress thing and I wanted to mix things up a bit. Can’t believe I didn’t find a way to incorporate Mickey Mouse into this outfit. But I think this goes to show that no matter what you wear to Prom, you will always look doofy. Anyway, Senior Prom ruled. We ordered Chinese food and ate out on a secluded lake that had a beautiful deck over it. We walked around the circle downtown Indianapolis and had a horse and buggy ride. We danced. We stayed up all night. It was fun!